In small bowl, mix sauce ingredients. Cover and refrigerate until serving. In large bowl, mix all crab cake ingredients except oil. Using 1/3 cup mixture for each, shape into eight 3-inch patties. In 10-inch nonstick skillet, heat oil over medium heat until hot. Add patties; cook 4 to 5 minutes on each side or until golden brown and thoroughly cooked. Drain on paper towels. 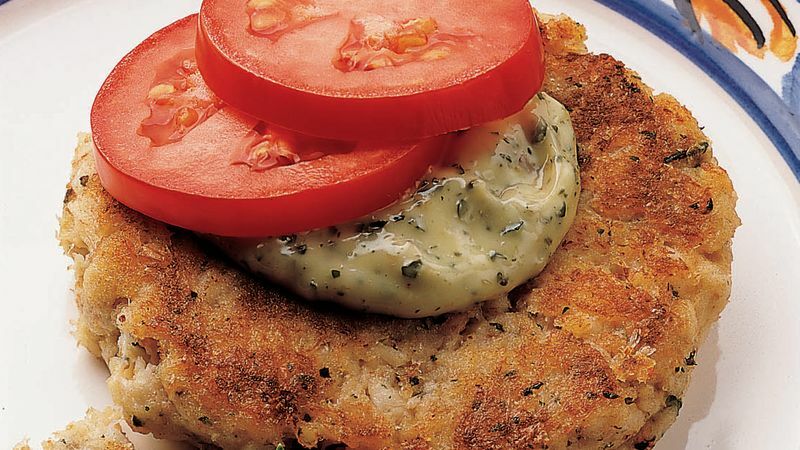 Serve crab cakes topped with sauce. Garnish as desired. Canned crabmeat (drained) or frozen crabmeat (thawed and drained) can be used for the fresh crabmeat. Serve with organic field greens and a splash of balsamic vinegar and olive oil dressing.